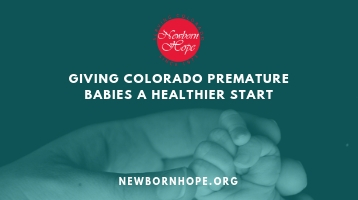 For the past 45 years Newborn Hope has made a difference in the lives of the tiniest babies in Colorado. Together, we’ve celebrated so many birthdays and milestones, thanks to the powerful work done statewide to support the challenges presented by prematurity. Today, prematurity is still the leading cause of death and lifelong disabilities in newborns. Together, we still have so much important work to do. Now, more than ever, we need your help. your gift will serve the smallest babies in the greatest of ways. Newborn Hope is striving to reach more families in our military communities; moms and babies in outlying rural and low-income areas where transportation challenges are great; and more diverse populations whose need for funding support and education is critical. Your donation is tax deductible, and all funds stay in Colorado.